The round-bellied cichlid (Amphilophus globosus) was discovered only last year. 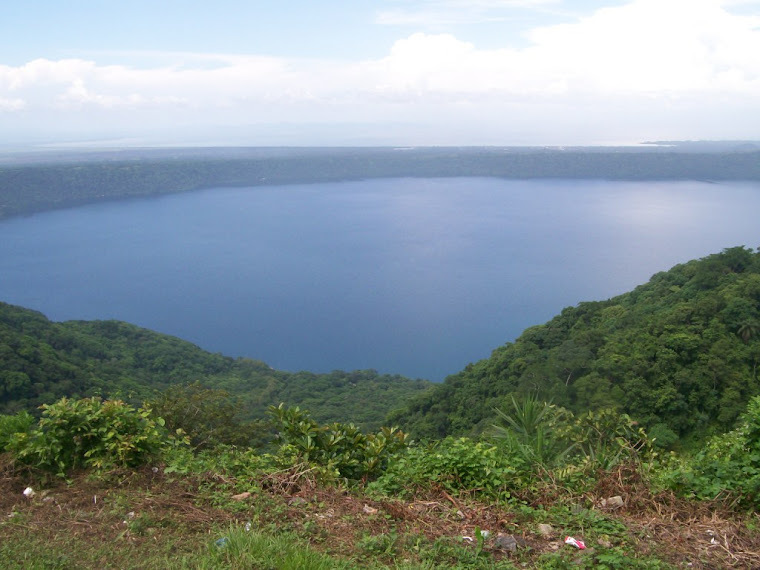 Almost no information exists about this species, whose range is limited to Laguna de Apoyo, Nicaragua. Our monitoring activity in the lake is dedicated in part to generating ecological information to facilitate an analysis of its conservation status and to recommend and evaluate conservation actions. Our Nicaragua SCUBA diving volunteer Garey Knop accompanied us on a SCUBA dive recently, where a nesting pair were observed. Garey photographed the female, although the male had escaped his view. She is the fish in the foreground in the bottom left of the photograph below. The male was much larger than the female, probably weighing about twice as much as her. The pair occupy the small cave in the background of the photo as a nesting site. Although considerable amounts of stirred-up sediment reduced the photograph quality, you can observe the light yellow color on the female, and the rounded abdomen in lateral view. Instead of the two dark lateral spots that are typical of nonbreeding A. globosus, this fish demonstrated a row of seven square spots. She was very busy chasing away juvenile fish trying to use the same cave as a refuge. There were no free-swimming fry in the nest yet, although the pair had already occupied this site at least four days at the time of the photograph. Although the photograph is not the highest quality, we found it important enough to post, because it presents the first photographic documentation of a breeding pair of this species. Would you like to work with us on discovering new fish species in Nicaragua? We need volunteers, both as certified divers and non-divers. We also need used dive equipment, underwater video equipment, and old computers. We can also provide thesis topics for interested students. Would you like to volunteer with us or make a donation? Please contact us.